David Rogers piece in today’s Politico on the reasons for the current profitability of cattle ranching is must read for anyone wanting a better understanding of the economics of a central segment of our food system. Clocking in at over 2500 words, it’s a bit of an investment, but well worth the investment. The basics? Beef prices are up, corn prices are down. Beef prices are up because we have far few head of cattle than we did even a few years ago. As of January 2014, the total inventory of cattle and calves in the U.S. had fallen to 87.7 million — the lowest since Harry Truman was president. More important, the number of all cows and heifers that have calved was just 38.3 million, the lowest since 1941 and Franklin D. Roosevelt. That’s been driven by the ethanol boom, which displaced hay and pasture in the Midwest to make room for more corn and three years of drought in states like Texas and Oklahoma. Meanwhile, exports to Asia have doubled in recent years, creating competition with domestic demand. This is in part driven by demand from China where US beef imports are illegal, but pour in through Vietnam and Hong Kong in a barely secret black market. With prices high, the industry is trying to respond by increasing herd sizes again. Here’s the catch, cows don’t have litters, they have one calf at a time. Too produce bigger herds, ranchers need to hang on to more cows to have more calves. The project of rebuilding a herd is a multi-year project. The challenge is compounded by the fact that cattle live outdoors in an uncontrolled environment. There’s a lot going on. Among the many fun facts in the piece: 84 percent of the beef cows in America are still in herds of 500 head or fewer. There are some parts of Ag that Big just won’t go. Joshua Keating at Slate has an excellent piece on the role food prices have political stability and the drivers in the rise in food prices since 2000. That trend is result of the intersection of having maxed out on the amount of food we can produce and the growing global middle class demand. The both for greater net calories and more meat and dairy. Keating shares a number of interesting facts and insights. Thailand’s program of supporting farmers by buying rice above cost and stockpiling it seems to be on the verge of disaster. Exporting countries like the US stand to gain. And speaking of the US exports, Keating noted that Iowa produces more grain than all of Canada. Here are the two most interesting bits. “Sixty-five percent of the world’s food-insecure people live in seven countries: India, China, the Democratic Republic of Congo (DRC), Bangladesh, Indonesia, Pakistan, and Ethiopia, of which all but China have experienced civil conflict in the past decade, with DRC, Ethiopia, India, and Pakistan currently embroiled in civil conflicts.” And China, it should be pointed out, hasn’t been all that quiet. With about 180,000 protests per year, the government now spends about $125 billion annually on riot control.
. . . China has also been at the forefront of the trend of buying large tracts of land in developing countries to meet demand for grain back home, a practice denounced by critics as “land grabs.” State-connected Chinese firms have purchased a swath of farmland the size of Luxembourg in Argentina as well as about 5 percent of Ukraine’s territory. Purchases on this scale bring up obvious concerns over sovereignty. Anger over the purchase of half of Madagascar’s arable land by the South Korean conglomerate Daewoo was a major precipitating factor in the overthrow of Madagascar’s government in 2009. Making agriculture work in Africa is going to be the lynch pin to a future that works. A few things caught my eye looking over this piece from CNBC on food fraud and rising prices. The Department of Agriculture predicts food prices will rise between 2.5 and 3.5 percent this year. And while the consumer price index was up 0.1 percent in February, the food index rose more sharply, at 0.4 percent. I don’t know about you, but I’ve definitely noticed sticker shock at the check out aisle. Little wonder. 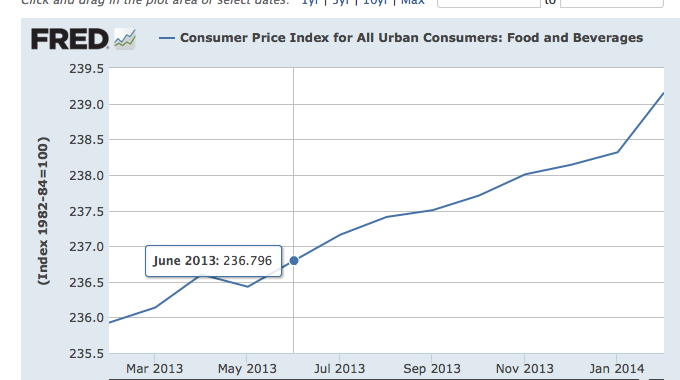 According the the USDA ERS, while the CPI rose 1.1% in 2013 it rose 1.4% for food. That 1.4% broke out into .9% for groceries (the same rate as 2012) and 2.2% for restaurant spending. But it’s since the beginning of the year that I’ve noticed the pinch and the numbers bear that out, especially for the kinds of foods I buy. Last year theose items went up faster than the rest of the CPI basket. Since the beginning of this year that trend has accelerated, especially since February and the forecast is for more of the same as we recover from the drought in California and the economic recovery returns inflation to normal historical levels. Relative to 2012, prices rose considerably for poultry, eggs, fish, and fresh vegetables; however, prices fell for nonalcoholic beverages, sugar and sweets, fats and oils, and other meats. For the remaining food categories, prices were mostly unchanged. From February to December 2013, average supermarket prices fell by 0.2 percent. Looking ahead to 2014, ERS forecasts that food price inflation will return to a range closer to the historical norm. The food-at-home CPI has already increased more in the first two months of 2014 than it did in all of 2013, but given its current trajectory, it is on track for normal annual inflation. Since 1990, grocery store prices have risen by an average of 2.8 percent per year. Inflationary pressures are expected to be moderate, given the outlook for commodity prices, animal inventories, and ongoing export trends. Retailer margins, having contracted since the drought, may expand in 2014 if input prices rise, which should contribute to inflation. The food, food-at-home, and food-away-from-home CPIs are expected to increase 2.5 to 3.5 percent over 2013 levels.
. . . Eggs continued their recent surge, increasing 0.7 percent from January to February. The CPI for eggs is now 5.7 percent above the February 2013 level. ERS has revised the forecast for egg prices upward to 3.0 to 4.0 percent in anticipation of increased exports as well as strong domestic demand (due in part to high meat prices) in 2014. Painful reading for someone who leans heavily on eggs and vegetables. Look at that spike in February. Ouch !!! Up to 59 percent of tuna is mislabeled, according to a study by advocacy group, Oceana. Customs and Border Protection chemist Matt Birck said escolar is often mislabeled as tuna and could cause digestive issues. 59% !!! That’s a lot of fake tuna. I had to wonder if a lot of non-tuna tuna was winding up in the pet food market, but it turns out that fish fraud in the fish counter and restaurant trade is widespread. Meanwhile in the TMI departemnt, I love escolar and have never had a problem with it, but apparently lots of people do. But a Government Accountability Office review found problems in the overlap between the agencies charged with stopping food fraud. For example, while the FDA regulates eggs in the shell, the USDA regulates them once they are in products. At first I thought that had to be backwards, wouldn’t the USDA inspect eggs and the FDA egg products? But it turns out to be correct. But that all the more underscores the crossed wires of having US Customs, the FDA and the USDA involved in regulatory overlap in vouchsafing the food supply. The FDA inspects shelled eggs, while the USDA is responsible for egg products, including liquid, frozen and dehydrated eggs. The FDA regulates the feed chickens eat, but the laying facility falls under USDA jurisdiction. If it sounds confusing, that’s because it is. This year’s investigation into the Salmonella outbreak in Iowa eggs was complicated by the fact that the USDA was responsible for the pile of manure next to the laying facility, but the FDA was accountable for the danger of the eggs themselves. Let’s construct a primitive infographic on the topic, shall we. It seems like that’s the kind of project that could make for a great bipartisan project in Congress, or a non-cabinet level tsar position in the executive branch. That seems like a better place to start than trying to place more burdens on a dysfunctional system.